Our range of products include reciprocal walker, adjustable walking stick, walking stick elbow support and walking stick quadripod. With our consistent focus on globally hit trend, we proudly introduce a wide assortment of Reciprocal Walker. 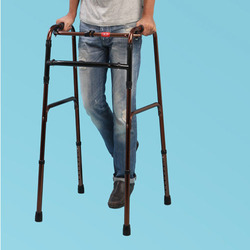 Offered walker is manufactured by our experts, this walker enables easy forward & backward movement. This walker adds comfort in walking for the patient. Our competent team of quality inspectors performs a series of quality tests on the existing range to make sure a defect-free delivery at clients' end. Being the leading names in the industry, we are offering an extensive range of Adjustable Walking Stick . This walking stick is manufactured using quality proven aluminum and is further anodized to enhance the lifespan of the stick. As well, our quality inspectors check this stick at every stage of production. 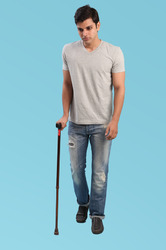 This stick provides utmost support while walking in case of disability. Riding on unfathomable volumes of industrial expertise, we are engaged in offering an excellent assortment of Walking Stick Elbow Support. This walking stick is manufactured by our dexterous professionals using lightweight aluminum in compliance with the set quality norms. Offered walking stick provides better & angular ground grip. This walking stick is available in numerous specifications to meet the set quality norms. Reduce pressure on wrist & hand while walking with stick. Backed by a team of skilled and experienced professionals, we are involved in offering Walking Stick Quadripod to our clients. This walking stick provides extra support for preventing falls & fractures. The height of the stick can be adjusted, this walking stick is manufactured using the quality assured material. Offered walking stick is vastly demanded its noteworthy features. 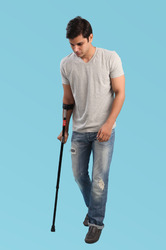 This walking stick gives support to disabled or injured person. Provides support to disabled or injured.